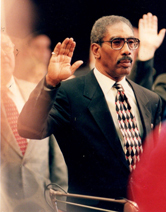 The Honorable Edward Vincent Jr., former State Legislator and first African-American mayor of Ingle­wood passed away Friday August 31 in Los Angeles. Edward Vincent Jr. was born in Steubenville, Ohio on June 23, 1934. He showed a love for sports and a desire to succeed. This helped him to gain an athletic scholarship to the University of Iowa in 1952. There he majored in public relations and advertising. Vincent excelled on the football field, receiving All Big Ten and All-American honors. As the third draft choice of the 1956 Los Angeles Rams, He played in several games before being sidelined by injuries. While serving in the military, Vincent received all Army and all Service Football Team honors. After an honorable discharge from the U.S. Army in 1959, he continued his education, earning a BA degree in corrections and social welfare from California State University, Los Angeles. He then embarked upon a 35-year career with the Los Angeles County Probation Department. Vincent was elected to the Inglewood Unified School District’s Board of Trustees, where he served as president from 1978 to 1979. Moreover, he represented the residents of District No. 4 on the Inglewood City Council from 1979 to 1983. In 1983, Vincent began his term as the first African-American mayor of the City of Inglewood and was re-elected for three additional terms. He was also commissioner of the State of California World Trade Commission. After he left office, the city renamed Centinela Park on Florence Avenue to Edward Vincent Jr. Park in his honor. Vincent served as a member of the California State Assembly from 1996 to 2000, representing the 51st Assembly District. In the Assembly, he chaired the Elections, Re­apportionment, and Constitutional Amendments Committee as well as the California Horse Racing Industry Committee. On October 24, 2000, Vincent received the Cuactemoc Award for outstanding public service on behalf of farm workers. The award was presented by La Cooperativa. Between 2000 and 2008 Vincent served in the State Senate. He was a member of the Senate Committees on Agriculture, Governmental Organ­ization, and Health. He also chaired the Select Committee on the Horseracing Industry. In this function, he authored legislation on gambling licenses, state teacher retirement benefits, horse racing, and community care facilities. He was forced to leave the Senate in 2008 due to term limits. .
Vincent is survived by his wife of 55 years, Marilyn, two daughters, three grandchildren, two great-grandchildren along with a host of relatives and friends. Viewing and Visitation, September 6 from 3-8pm, Inglewood Mortuary, 1206 Centinela Avenue, Inglewood, California 90302. Funeral Service, September 7 at 11am, Galleria Chapel-Mausoleum of the West, Inglewood Park Cemetery-720 E. Florence Avenue, Inglewood, California 90301. Internment, Immediately after service. Mission Chapel, Sunset Mission Mausoleum.